Opening Reception: Saturday, November 1, 6-9 p.m. Focusing on the transformative aspects of printmaking, Beyond a Memorable Fancy explores the current trend of artists experimenting with print techniques in order to appropriate and manipulate information—be it from text or image sources, cultural symbols, or nature. The art in the exhibition spans a range of unconventional formats, including experimental film, laser stencil graffiti, vinyl signage, cast shadows, and boat-making paraphernalia. Even the more common print techniques present are used to achieve an unexpected result. Many things are not what they seem: Heidi Neilson mashes jail uniforms into pulp, converting them into orange Nerf-like handmade sheets of paper; while Evan Roth turns images of glamour into visions of horror with an algorithmic program revealing how many times a magazine photo has been retouched. Ian Cooper appropriates “Charlotte’s Web,” creating a menacing screeprinted silk web of copper ink against a black ground, the familiar words Some Pig turned from praise into reproach; while Glen Baldridge appropriates found images of coffins to create oversized lottery scratch-off games. The exhibition welcomes the spirit of collaboration and open participation. Peter Simensky, with his Collector wooden milk crate multiples, invites peers David Gatten, Max Schuman and Matthew Higgs to micro-curate their own displays of print-related objects, film, artists’ books, and record albums respectively. The Graffiti Research Lab illustrates for aspiring provocateurs how a handheld strong light laser can transfer a tiny stencil message onto a bridge or a building, and then disappear in a flash, enabling the expression of something bold and uninhibited with little risk of repercussion. 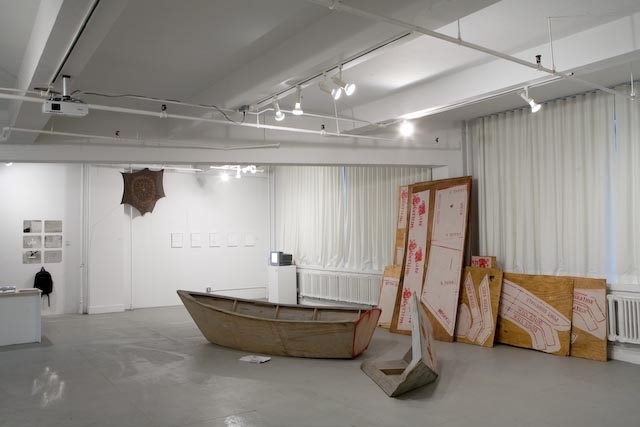 A full-scale boat on display, the result of the collective brainpower of Benjamin Cohen, Dylan Gauthier and Stephan von Muehlen, demonstrates how this inventively developed schematic diagram may be stenciled onto repurposed plywood, salvaged from building sites, and constructed into boats by novice boat builders. Graffiti and boat building demonstrations and workshops. MOXON’S MECHANICK EXERCISES, OR, THE DOCTRINE OF HANDY-WORKS APPLIED TO THE ART OF PRINTING, 1999/2008. Cellophane tape and ink transfer strips, 16mm black &white film loop, 16mm projector and paper fiber screen. Aqueous screen print on silk with stitching.